Unless you’ve been vacationing off-planet recently, you’ve probably heard of the university’s Attendance Initiative. You have been presented with 2 options for reporting attendance. Manually enter attendance results in Banner’s “Attendance Tracker” tool. Set up a an appropriate academic activity in Blackboard so that attendance attendance reports can be run automatically. *Only these tool types will provide automated attendance data so that you do not have to manually report it using the Banner attendance tracker. Each of these activities are great first week activities on their own in that they get your students engaged with the course from the start. They are not a heavy lift for your students in terms of difficulty level, or for you in terms of grading. Click the activity name to see ideas for each of these tools that you can employ to fulfill the Attendance Initiative Requirements. When should due dates for these activities occur? We recommend that due dates be set for these activities on 9/7 and 9/8 in case of any delay in reporting. Do I have to grade the assignment before the 12th class day? No. Only the student submission is required for attendance purposes. You can grade these submissions whenever you want or set it up as a non-graded or completion/incomplete activity. Is this just for faculty who teach online? No. Any faculty member teaching an online, hybrid, or face-to-face class can take advantage of the automated option by deploying one of the activities listed above. Have your students each post a blog entry on what they hope to get out of your class for the semester. You and their fellow students can comment on entries as needed/required. Have students share an experience that led them to taking your class or deciding upon their major. You can decide to make the journal public to the class or just in between you and the student. Have students turn in a KWL assignment. KWL – What do you know about the topic? What do you Want to Know? What have you learned? This assignment is great as it helps you determine where you might want to spend some more time as you teach the subject and it lets the students come back at the end of the semester and update you on what they have learned. Have each of your students submit a post to an “Introduce Yourself” discussion forum. Ask them to share things like: Major, Hometown, Hobbies, Why they are taking the class and even something fun (If you one super-power, what would it be?). You can then encourage the students to reply to their colleagues to gain full credit for the assignment. A great way to start off the semester and ensure your students are familiar with what is expected of them is to have them take a syllabus quiz. This low-stakes assessment is perfect for getting your students used to taking quizzes/exams in Blackboard and ensures that they actually read the syllabus! Welcome back Bearkat faculty! 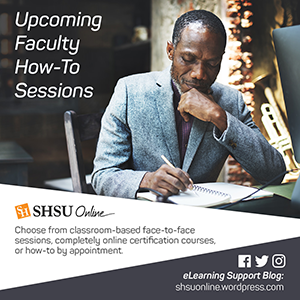 The Fall 2016 semester is here and so are the SHSU Online faculty development opportunities! Go fully online and earn your Teaching Online with Blackboard or Multimedia Master Certifications by enrolling in one of our two Blackboard certification options. Enroll in our Blackboard Collaborate Ultra Webinar and learn how to use the Collaborate Ultra by participating in an online web meeting that uses the tool. Attend one of the face-to-face how-to sessions here at the main campus or at our Woodlands location. Teaching Online With Blackboard [Cohort 9] – Enroll in each of the 4 courses separately. Teaching Online– Strategies for Success: 2-Week course that presents participants with the opportunity to explore best practices for creating engaging and effective online learning environments. Blackboard Learn: Using the Grade Center: Participants will learn how to use the Blackboard Grade Center to record data, calculate grades, and monitor student progress. Manage students’ grades and create grade columns for any activities or requirements you wish to grade.